Bring your appetite on Sunday, December 2! 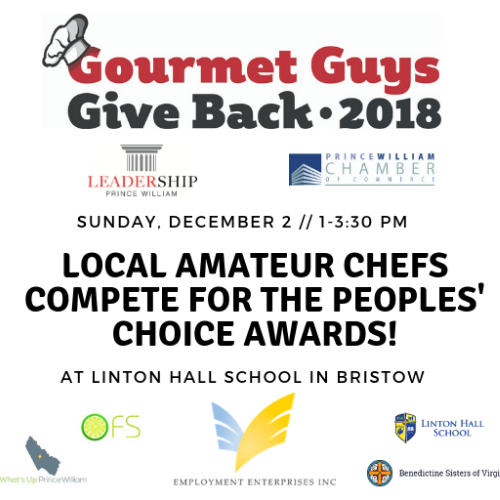 Gourmet Guys Give Back is a family-friendly event where local amateur chefs compete for “People’s Choice” and Judges’ Awards for their tastiest dishes. You’ll enjoy delicious food, raffle prizes, kids activities, music and more! Proceeds benefit the programs of Leadership Prince William and the PW Chamber of Commerce. Sample great food by local cooks – appetizers, sides, soups & entrees. Vote for your favorites in the “People’s Choice” awards. Win great raffle prizes. Enjoy music, kids activities & other entertainment!